**first row rectangles worked onto base triangles**. k these 4 stitches in i-cord for 3 inches. 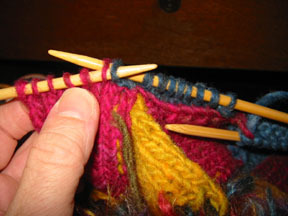 bind off, tie into knot. 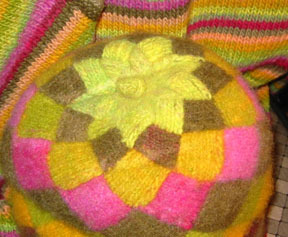 knit 2 handles. i chose to make mine short. i-cords make good handles. i didn't do it that way though. 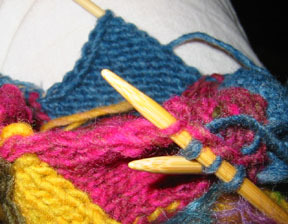 i cast on 11 stitches, knit back and forth for 14 inches, always slipping the first stitch. then i folded this in half and stitched it up. 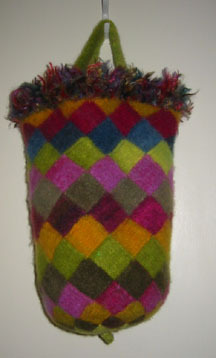 **sewing on handles** after felting allows you to adjust the size of them to your liking. the slipped stitches make easy to see places to pick up stitches on following rows. 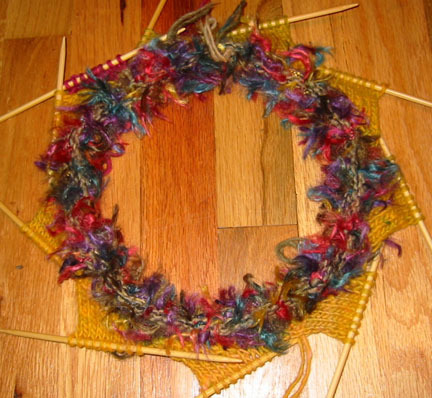 when changing color, a square knot on the inside holds up well during felting.